At the 2015 Frankfurt Motor Show, Porsche took all the golden badges as they unveiled their all new Porsche Mission E Concept 2015. The stunning model is company’s another heart throbbing creation after the 918 Spyder and it looks like they have decided of ‘no rolling back’. 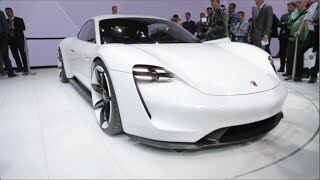 The concept looks like an attempt to rival the Aston Martin Rapide but before giving the final verdict, let us have a look at the review of Porsche Mission E Concept 2015 to know more about it. Getting to the interior of Porsche Mission E Concept 2015 you’ll take a step closer to the coming era of automotive industry. Fitted with four bucket type racing seats, the electric sports car has lot to steal the gleam and keep the essence of serenity inside. The instrument cluster gets a unique curved (more like a boomerang) design with five gauges in total featuring OLED technology. There is also a small screen over the dashboard which will be displaying rest of the information that could prove to be of interest for the driver. Though I’m not sure about the concept being turned to the production version but would say the ‘one of its kind interior’ will impeccably roll the entire automotive industry. Rounding up the interior details of Porsche Mission E Concept 2015 all I would say is, it has everything that you’d dream about. 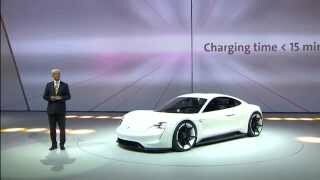 The exterior of Porsche Mission E Concept 2015 is just as what you can expect from Porsche, smooth and luxurious. Starting with the front four LED integrated headlights sitting at both the corners. Looking at this setup you might presume the LEDs to be ‘daytime running lights’. The sedan gets a coupe like roof line which will undoubtedly grab your attention and also has counter opening doors which makes it easier and smarter looking model. Engineers at Porsche are using cameras instead of rear view mirrors, pictures of which will be displayed on the lower windshield corners. Moving towards the rear end it has horizontal tail light running along the width of the car and right beneath it is the three dimensional Porsche badge adding to the glory. 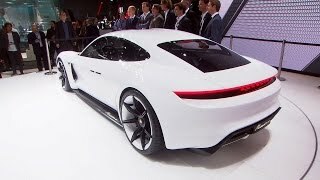 Rounding up the entire exterior details of Porsche Mission E Concept 2015 I would just say, be prepared to steal the light while riding this luxurious model. The Porsche Mission E Concept 2015 gets its power through two permanent magnet synchronous motors producing total output of 600 hp. 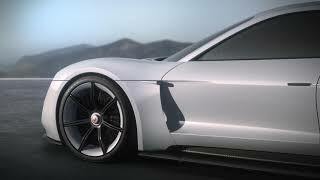 With this power rolling the wheels, top speed of Porsche Mission E Concept 2015 touches the mark of 155 mph and can sprint from 0-62 mph in just 3.5 seconds.